Envy Exteriors is the primary business for landscape design & installation in Conroe. Together, our Registered Landscape Architect and skilled crews offers expedient, professional, high quality design and installation for any size property. We are the chief firm for landscape construction in Conroe. We can give you the backyard or property you have dreamed about without blowing your budget. We want you to feel confident in selecting us for your landscape construction needs. You will not only have the benefit of professionals that have been in business since 1999, but you are guaranteed complete satisfaction with the finished product. Envy Exteriors can help you design and build a custom outdoor living space that will enhance your outdoor lifestyle, complement your existing decor, raise your home’s value and make your backyard much more enjoyable for you and your family in the Conroe area. Your custom outdoor living space can be equipped with a solid tile roof to match your home flawlessly. Many of the outdoor kitchens, cabanas, bungalows, arbors, sunrooms and pool houses we design and build match the home so effortlessly that they appear to be a part of the home’s original blueprints! Does your backyard look dated? Does your pool need a new look? Turn what was once nice into your dream pool or backyard oasis! Remodels can range from the simple - such as updating tile or resurfacing the pool, to the elaborate- such as reshaping the pool, adding a spa, or custom water features. Envy Exteriors can make a dramatic difference in the look of any backyard pool. 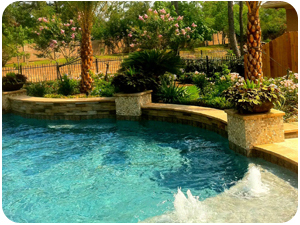 We are the best choice for outdoor pool remodeling company in Conroe area. Envy Exteriors will design and install a "one of a kind" landscape to fit your budget.